The Brazilian progressive/power metal band Angra are back with a new member and a new album, Omni. Bassist Felipe Andreoli gives us the scoop on new guitarist Marcelo Barbosa (who replaced Kiko Loureiro, now in Megadeth), the new record and other topics. Chad Bowar: How did guitarist Marcelo Barbosa come to join the band? Felipe Andreoli: Marcelo was the obvious choice for many reasons. First of all, Kiko himself chose him as his replacement. Second, he is one of the most recognized guitar players in Brazil for his talent and skills. He had replaced Kiko for some shows in the past, and it worked out very smoothly. But, most importantly, he has been a great friend for many years, and someone we’re pretty comfortable with om a personal level. 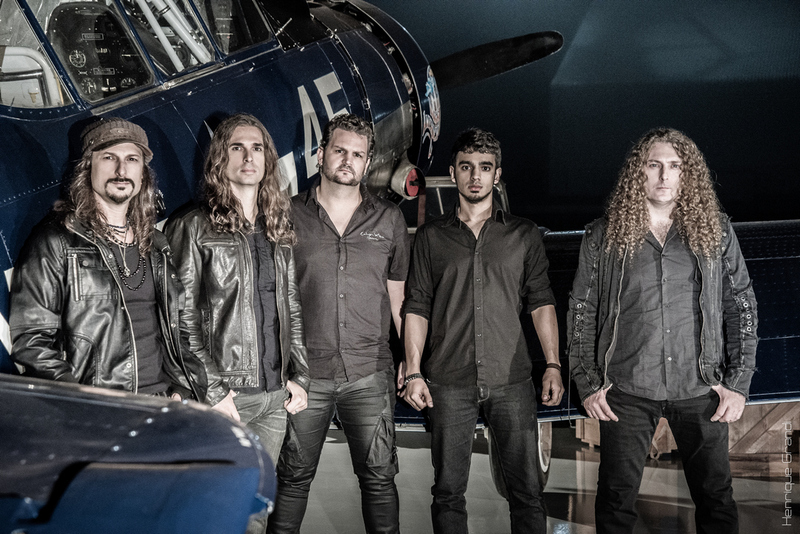 How did the songwriting process for Omni compare to the typical Angra album? This time around we had a more organic process than ever before. We didn’t use drum machines or write music in a computer. We wrote the vast majority of the material in a rehearsal room, with at least two or three of us working on the ideas. These days is very common to have the entire album done in a computer before the band even gets to play the songs, but doing it in this organic fashion really makes a difference. What led you to work with producer Jens Bogren again on this album? We feel that Jens really gets what we’re trying to do. He understands the different nuances in the music, and he encourages us to go further and embrace ideas that may seem odd at first, but really end up adding to the uniqueness of the music. Not to mention his amazing talent and character. He’s a really great guy to work with. What is his producing style? He likes to understand the band’s mindset and make you comfortable to create and try ideas, while at the same time making the process very efficient and productive. He’s very particular about the sounds he wants, to a level of detail that’s almost insane. But the results really speak for themselves. We had a really great time writing this album. Just the moments that we spent together, especially at Rafa’s family country house, were really special. All the time there was a sense of teamwork and common objectives, and I feel that everyone in the band was very excited and in sync. We fell like a much stronger band than we were before Ømni. What is the album’s concept? The main story revolves around the idea that one day we will be able to travel in time and communicate with humans in past times, through an artificial intelligence system. So the songs are short stories that talk about different aspects of this communication and its consequences in several periods of human existence. How did Alissa White-Gluz’s guest appearance come about, and what was the impact on the album? We played at the 70,000 Tons of Metal cruise in the beginning of last year, while we were conceiving the first ideas, and Arch Enemy was also playing. While we watched their show, we were amazed with Alissa’s performance, and immediately started wondering how a song with her voice would sound on our record. Fabio already knew her from his time with Kamelot, so he got in touch and she said yes. We wrote a song specifically for her, where she plays different moments of the same character, the Black Widow. We think that Ømni really captures our essence as a band, with elements that shaped the band’s sound throughout the years, but at the same time shows what we are today. My hope is that people will listen to the music with open minds, because we are really proud of what we have done. Already we can see that this album will take us very far. You have tours coming up in Europe, Asia and South America. Any plans for a North American tour this album cycle? Yes! We’re working on dates in the US and Canada following our show at the Prog Power festival in Atlanta. As of now we have a tentative schedule of 23 shows. Outside of South America, where would you say is Angra’s biggest fan base? Definitely Japan. They were the first people to believe in and support the band, and they have a huge part in Angra’s history. We are forever grateful for their love and support. I’d really like to play in New Zealand. I’d love to visit the country and know more about it. What’s the coolest site/landmark/attraction you’ve seen while on tour? We’ve been lucky enough to have visited many amazing places, but I think that the Mexican pyramids stand out. With several members also in other bands, how challenging is it for scheduling album recording and touring? It’s not difficult because we all know that Angra in the number one priority, so when it is time to do something with the band, everything else has to wait. Looking back at the Angra catalog, is there an album you think was overlooked or underrated when it was released, but has held up very well over the years? Aurora Consurgens is one such case, in my opinion. It came right after Temple of Shadows, which was very acclaimed, and it got kind of put aside because we went in a different direction. I think there’s some pretty good stuff in there. I’ve been listening to bands like Textures, Gojira, Tesseract, this kind of heavy, progressive music. I would like to invite the readers to our Facebook, Instagram and Twitter profiles. And thanks a lot for the interview.